Bank Indonesia (BI) Representatives of Papua throughout 2017 have destroyed about Rp1.5 trillion of shabby money, then replaced with new money, it was conveyed by the Head of BI Representative Papua, Joko Supratikto. He said that the most shabby money found in mountainous areas of Papua, compared to coastal areas. "Worse money is still found in Papua, Bank Indonesia (BI) is tasked to withdraw the money, then destroy it," Joko said recently in Jayapura. According to him, from 29 districts / municipalities in Papua, only one district has not been visited by BI for the withdrawal of shabby money, namely Puncak Jaya Regency, the reason for security considerations, therefore it will coordinate with the police to visit Puncak Jaya, if not in year this may be early next year. "To reduce shabby money, we also cooperate with other banks, with cash deposit system. Currency cash currently exists in Biak, Timika, Serui, Wamena, Nabire and Merauke districts. 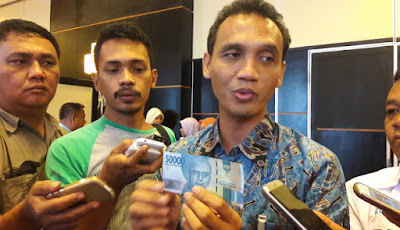 There is also BI Jangkau in cooperation with Bank Papua, where for the circulation of money not only in district cities, but up to the districts, such as in Boven Digoel and Mappi districts," he explained. In addition to the BI program, BI also cooperates with BRI, also has opened Money Changer and ATM at the RI-PNG Border (Skouw) with the aim of reducing the transaction of Quinine (PNG currency) in the area. "Some time ago, we also have conducted massive socialization to traders and migrants, in order to use rupiah money as a means of transactions," he said. The daily transaction quantity of market in the RI-PNG Skouw Market is around Rp 2 billion to Rp 3 billion, and by Christmas time it can reach Rp 4 billion to Rp 5 billion.